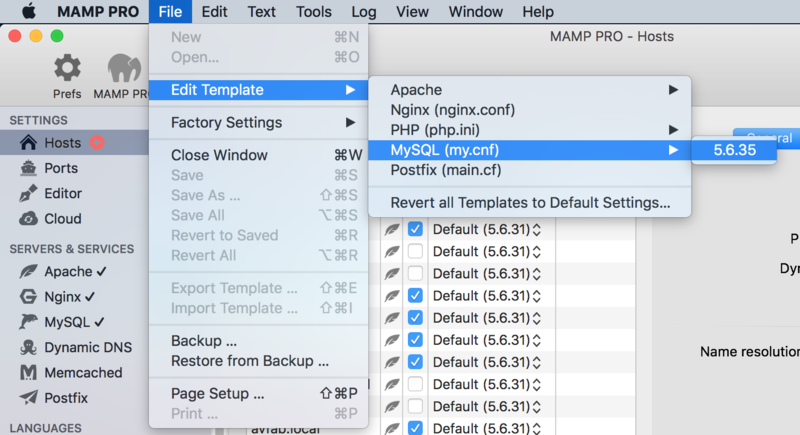 I recently had to install MAMP Pro, in order to do some separate work from my Laravel Homestead VM. To fix this, go to MAMP, File > Edit Template > MySQL > [version] and add the line highlighted below. The restart the server. After this you can comment out that line. Hopefully you will now be able to run the server again. Thank you, you’re a lifesaver. I tried /Library/Application Support/appsolute/MAMP PRO/db/mysql56 renaming the log files…did not work. THIS worked beautifully! Thank you! BLESS YOU! Been spinning my wheels on this all day! Thank you! No other solution has worked for me. Worked perfectly for me – thanks! I had previously tried to uncomment the same command further down the file – without success! thanks so much … you saved my day ! There are no such thing as a stupid question right? ..how do I go to “File > Edit Template > MySQL > [version]” in MAMP ? I cant figure it out ..
haha, you’re 100% correct! Here, see this screenshot. You should see something similar. I’ll update the post if this is useful. Thanks for this, worked perfect! Like others have said, thank you! Copy and paste the line Nacho provides in his post, save and then start MAMP. My MAC crashes occasionally and I always have problems starting MySQL (normally have to resort to restoring really old databases), however this force recovery fix solves this in an instant.